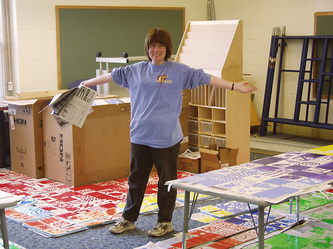 Linda Widstrand was teaching an after-school art program in the Lunenburg Elementary School in 2005, when she was approached by the Principal, Mrs. Cynthia Daukantas. Mrs. Daukantas asked Linda if she would be interested in making a mural in the new Lunenburg Primary School, which was under construction. 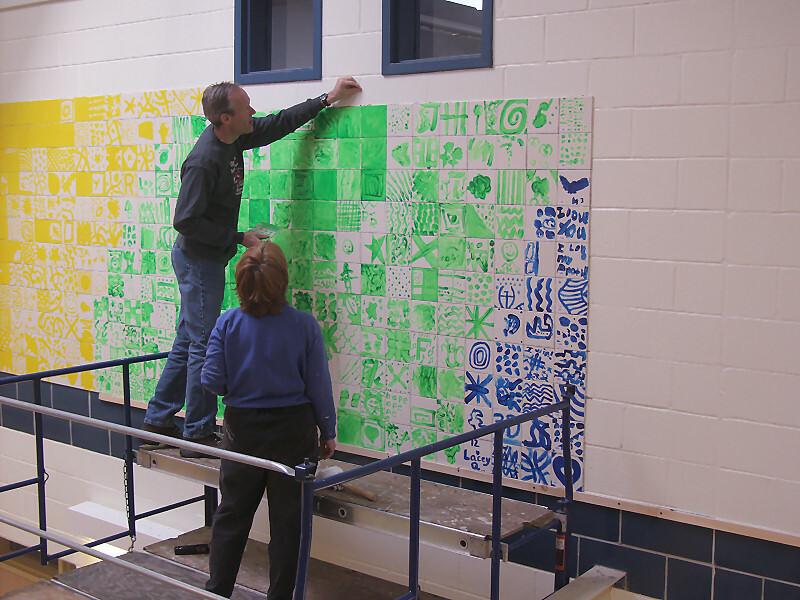 The mural would be installed on the Atrium wall in the school, and Mrs. Daukantas wanted to involve the children of the new school in the project. Linda thought it sounded interesting and visited the new Primary School to see where it would be installed, and what could be done with the wall. After researching what types of materials that could be used; and visiting other schools where mural projects which involved the children had been created, Linda came up with the basic idea for the wall. 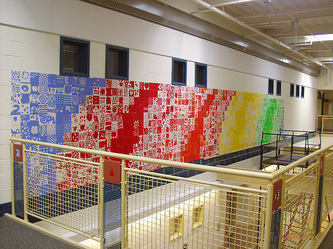 A test of the conceptual design was created in Microsoft Visio, to verify the planned layout for the mural; each individual color’s tile count and the curve radius for each color element. Each Child, School Teachers and Staff painted three tiles each. In 2006, all the materials were ordered and delivered. The tiles were drop-shipped to the school because of their weight. All the acrylic paint, brushes, acrylic sealer and wall tile setting compound was delivered to Linda or bought from the local building supply store. In January 2006, with the help of volunteers from the Lunenburg PTO, friends of Linda and parents, the painting of the tiles started. Individual color stations were set up on tables in the Atrium. The children were brought in, one class at a time, to paint tiles. 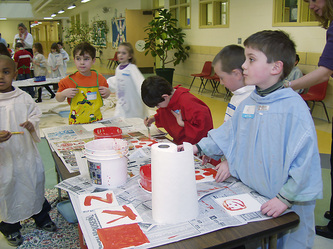 Smock-clad children used paint brushes and fingers to create their own masterpieces. Based on the total count of tiles, each child, staff and volunteers painted three tiles each in three different colors. As the mural was designed with seven colors, there was enough for everyone to let their fantasy loose in their artwork. When all the tiles were painted, two coats of clear acrylic varnish were applied to protect the tiles and provide a soft sheen to their surfaces. 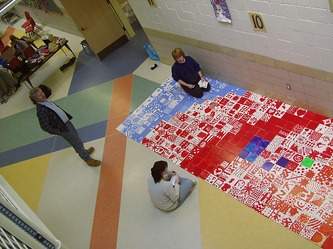 Saturday, one week before the installation, the whole mural was laid out on the floor in the Atrium. At this time, Linda finalized the design and layout of the mural, moving tiles around within each color group. When the design was completed, every individual tile was labeled with a row and column identifier. This would ensure that the tiles would be installed in the correct order, and would also significantly speed up the installation process. The mural was installed during February vacation, when there would not be any children in the school. This week was chosen for the safety of the children, since all the installation work would be conducted from mobile scaffolding. Volunteers helped install a horizontal board along the wall to provide support and a reference line for the first row of tiles. Once the support board was up on the wall, the installation ran like clockwork. The whole installation of the mural was completed during the week. All that remained the week after was to remove the support board, caulk the vertical edges of the mural and do final clean-up. At this time, the children were back from vacation. They stopped in awe in front of the mural, and pointed out where their tiles were installed!